I received the below email from Nordstrom on Friday, and in my opinion, they nailed a number of things with this communication. I also noted a few areas of opportunity. 1) Subject line: “Customer Faves: Our Most-Wanted Sandals” instantly got my attention. I was curious what’s popular among their shoppers (social proof at its best). 2) Simple and straightforward creative: the imagery was easy to follow, brand names were called out prominently, and it wasn’t too busy. This email was easy to navigate quickly. 3) Casual hand-drawn arrows: The hand-drawn arrows moved my eye toward each product (shoe as the hero), and conveyed a fun/lighthearted and casual tone to the email. 4) Customer testimonials: The quotes provided were simple and in the voice of a consumer. Even if I didn’t read these word for word, it made me feel that there would be other reviews on the site if I clicked through, and gave credibility to these styles being customer favorites (vs. simply styles Nordstrom wants to promote). Whether that is true or not is another question, but the perception was there that these are legitimate customer quotes. 1) Add a link at the bottom with an image of a bunch of similar customer favorites “…and 50 more!”. I wasn’t personally smitten by any of these sandals, but may have clicked through to see other styles if they were easily accessible. There was a link to “Shop Sandals” at the top of the email but by the time I scrolled down beyond this, I wasn’t of the mindset to scroll back up, so I wouldn’t have clicked through this email at all. I think one other small image may have enticed me to continue shopping sandals, but didn’t happen in reality. 2) If a user does click through, the experience should be more tailored. Currently, if you do click on one of the particular sandals, you’re taken to a general sandals page, with the top row of sandals shown being the four highlighted in the email. I expected that you’d be taken to the specific product detail page of the sandals you clicked on, or at least a page largely emphasizing that individual style. It seems Nordstrom could have created a more customized experience based on which sandal you click from the email – showing you that one most prominently, with others similar in style or from the same brand below. I understand why technically their implementation was an easier solution (one large image in the email, so anywhere you click takes you to the same place), but it was less customized/tailored than the experience could be. I also imagine that the email marketing team is a different team than controls the product pages, and has less influence/control over what happens once users click through, but are primarily charged with generating clicks to the overall Nordstrom site. 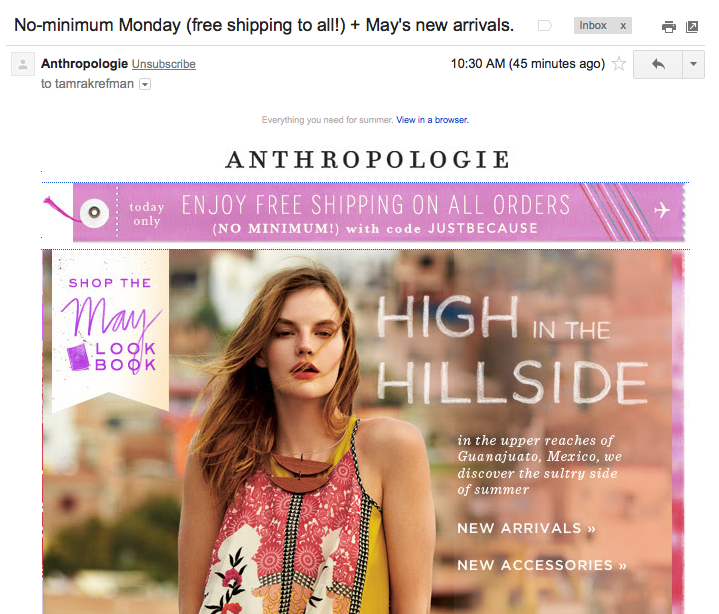 Overall, I was impressed by this email though – nice work, Nordstrom!